We accept cash, checks, Visa, Master Card, Discover, and American Express. Payments can be made online through our website. If you have a previous outstanding balance on your account, please plan to pay it before your next visit at your next visit. 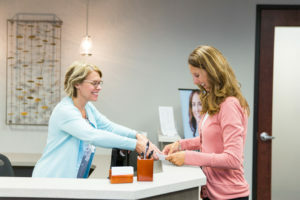 For patients without insurance coverage, payment is due at the time of service. Many insurance plans require us to collect a co-pay at the time of your visit. Your insurance card may note if your plan requires a co-pay, or it may not. Please familiarize yourself with your co-pay requirements, and be ready to pay your co-pay upon arrival at our office. Additionally, many insurance plans also require co-insurance. Co-insurance is often referred to as a percentage. An example of this could be an 80/20 plan where your insurance pays 80% and you pay the remaining 20%. Finally, many insurance plans require deductibles. A deductible is a set dollar amount you must pay out of pocket before your insurance begins to pay for any health care cost. If you do not know your co-pay, co-insurance, or deductible status, check with your insurance company before your visit. Co-pays, co-insurance, and deductibles vary and are specific to your particular health plan. These levels are set by your employer in combination with your health plan. Your doctor’s office has no involvement with these decisions. If you have questions about insurance, please call your health plan using the number on the back of your insurance card. They can help you understand what is or is not covered by your insurance. Not all providers participate with every plan. Our physician assistants do not participate in Medicaid or Humana. We will do our best to match you up with a provider that accepts your insurance. For prescription refills, please contact your pharmacy to check if you have additional refills remaining. The pharmacy will then fax a request to Center for Dermatology. We require 48 business hours to process all refill requests. Your prescription will be refilled if the proper medical criteria have been met – if not, you will need to make an appointment. An appointment is required to obtain a new prescription. If a prescription needs prior authorization from your insurance company it will be handled in a timely manner. Insurance providers vary in the time it takes to process prior authorizations. Please see the prescription medication information sheet available on our website for additional information about prescription medication. Please call our office if you have trouble making payments on your account. If possible, we will work with you to create a payment plan. Accounts with an outstanding balance over 90 days past due, that have failed to make payment arrangements, services charges will be added to your balance due and you will be turned over to a collections agency. At that time, you will be terminated from the practice and patient services from Center for Dermatology will no longer be available after an account is turned over to collections.